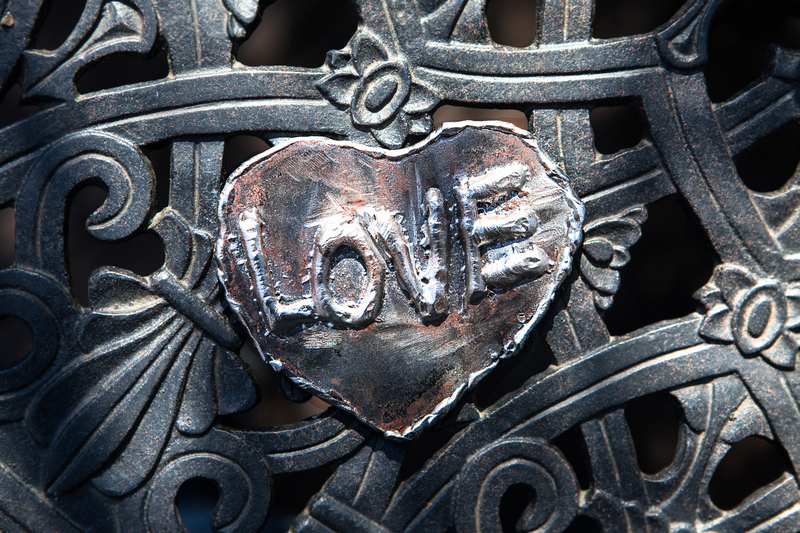 If you follow me on Instagram, AllSparkledUpDesign, you know I’m posting A Month of Hearts. 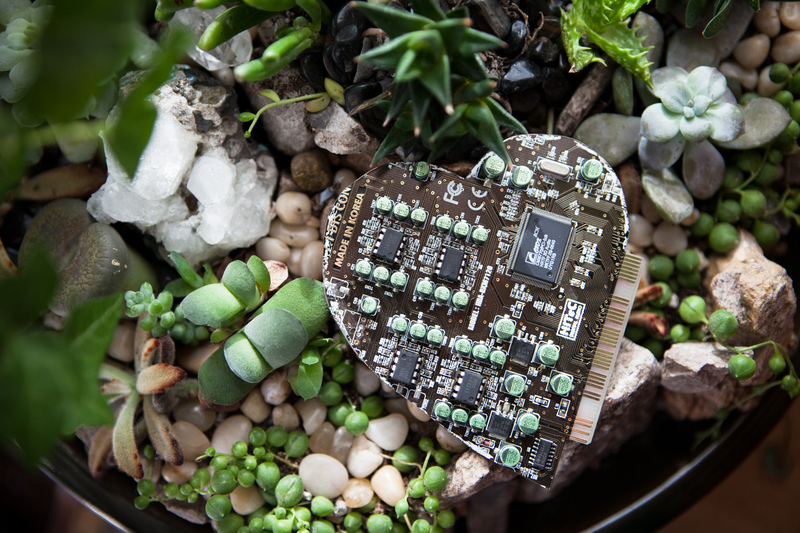 Today is Day 14 and there are 14 days of hearts to go! 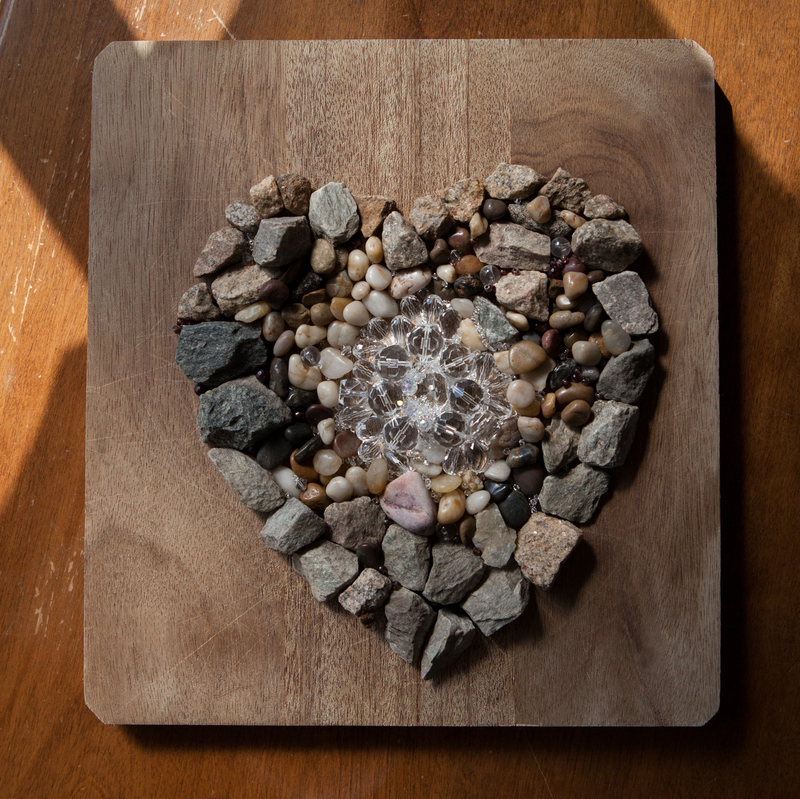 Here are the hearts I’ve posted so far. Make sure you check instagram so you can read all the captions that go with these photos. 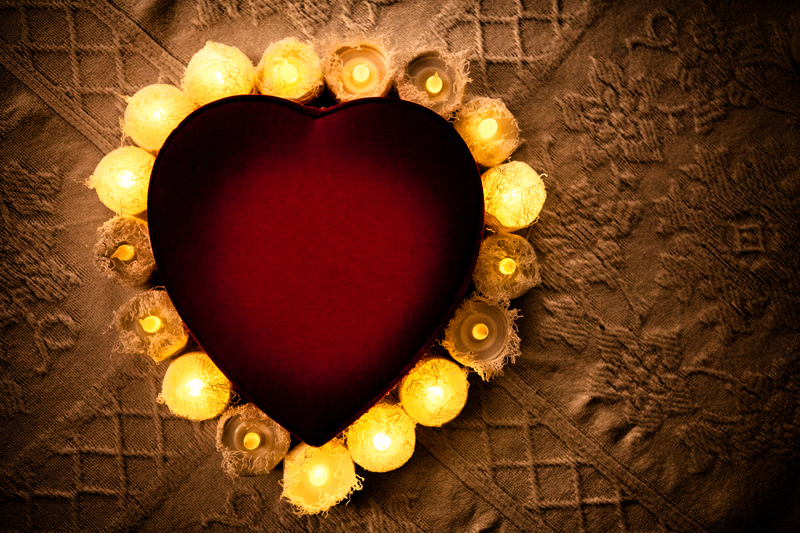 Love to you all! 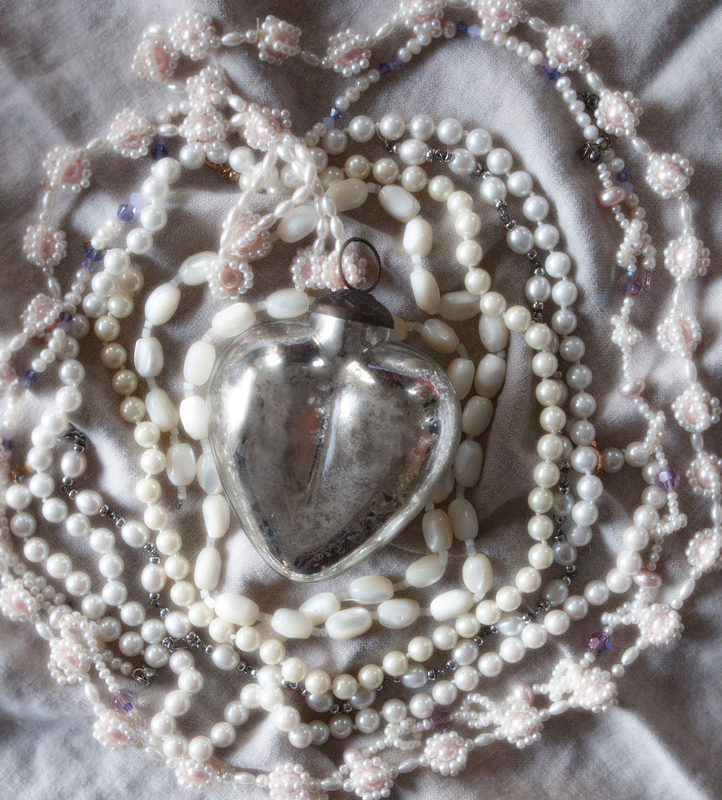 Mercury glass heart and pearls. 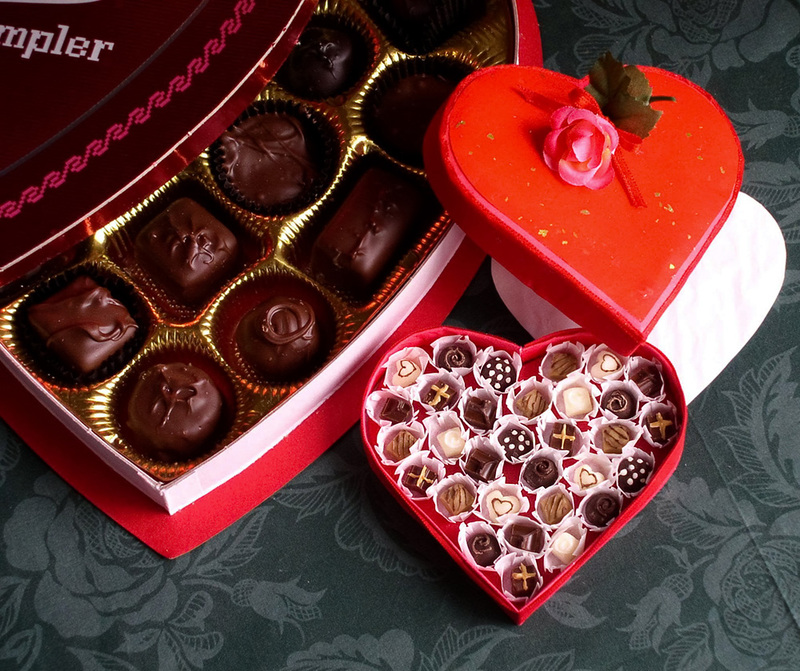 Ribbon Flower velvet candy box. 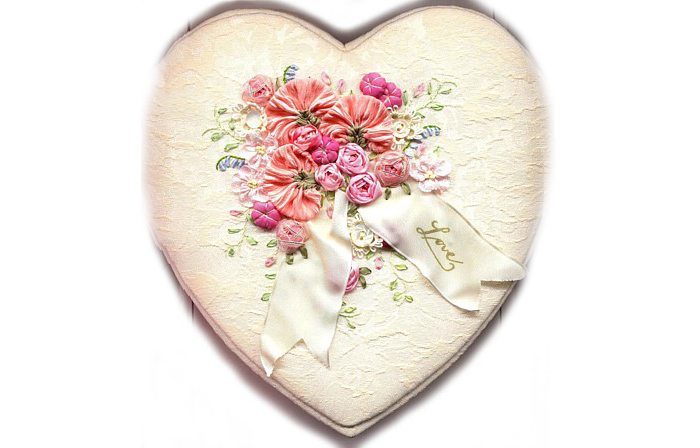 Silk Ribbon Embroidered heart box. 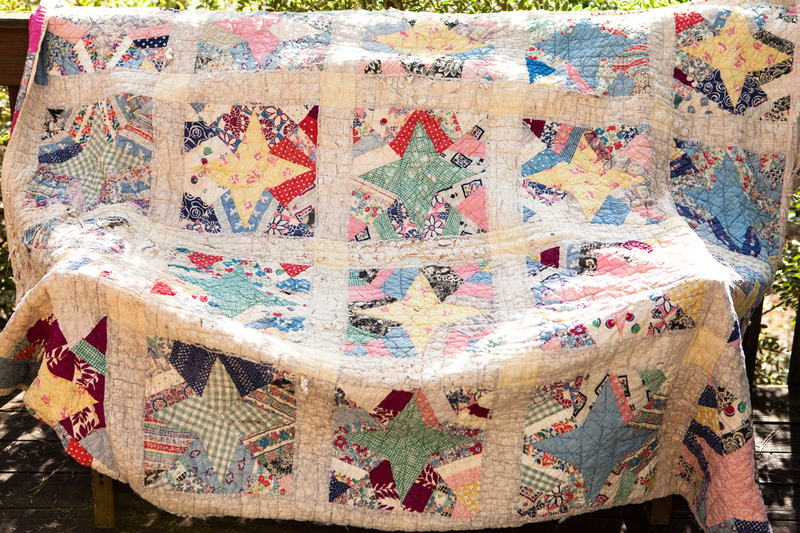 I went treasure hunting… INSIDE an old quilt! We’ve had this quilt for about 30 years. 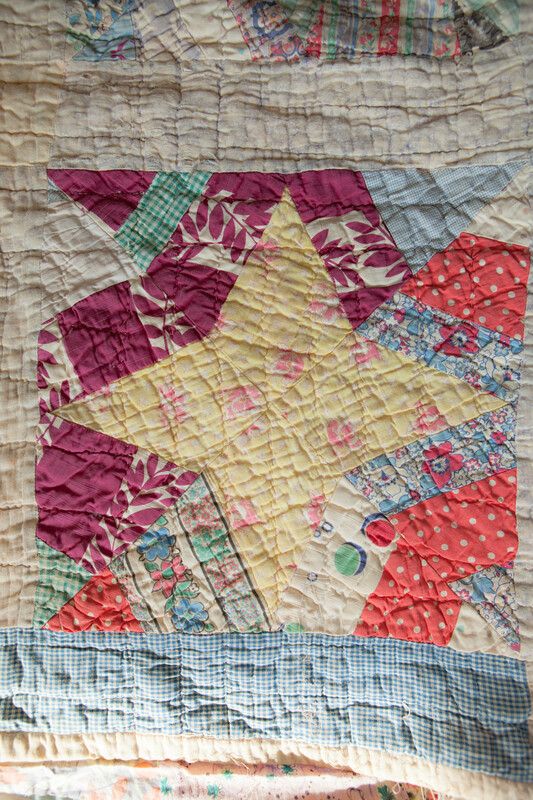 We know who made it but the history of the quilt is now lost. 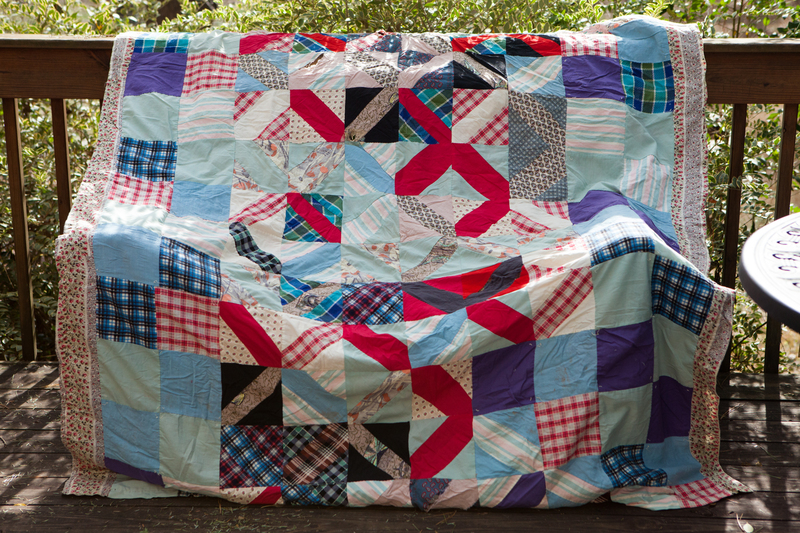 The old red, white and blue quilt. 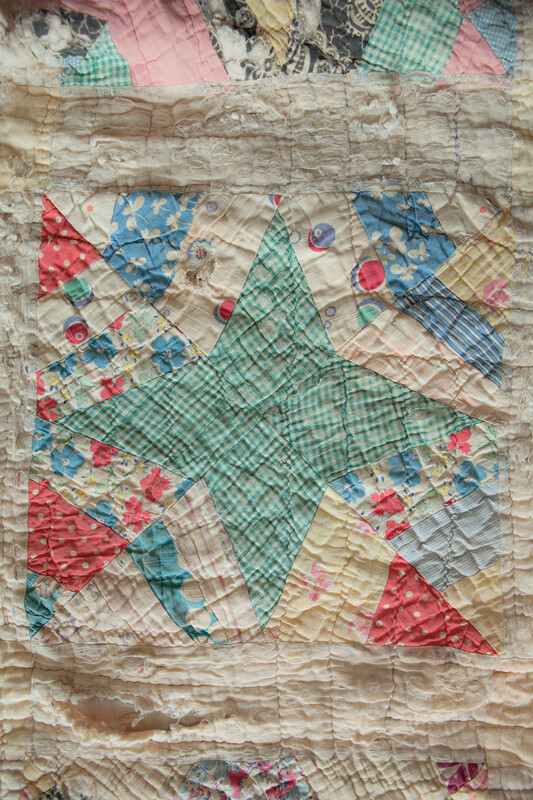 The quilt was mostly just displayed folded or kept in a box. When I got it out the other day, I noticed a new tear in the fabric. 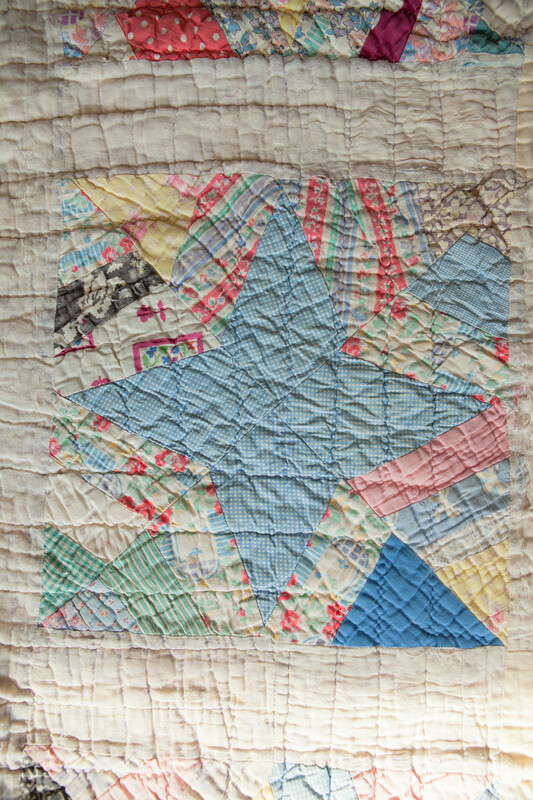 I looked closer and then peeked into the tear and was amazed that there was another quilt inside the old quilt! 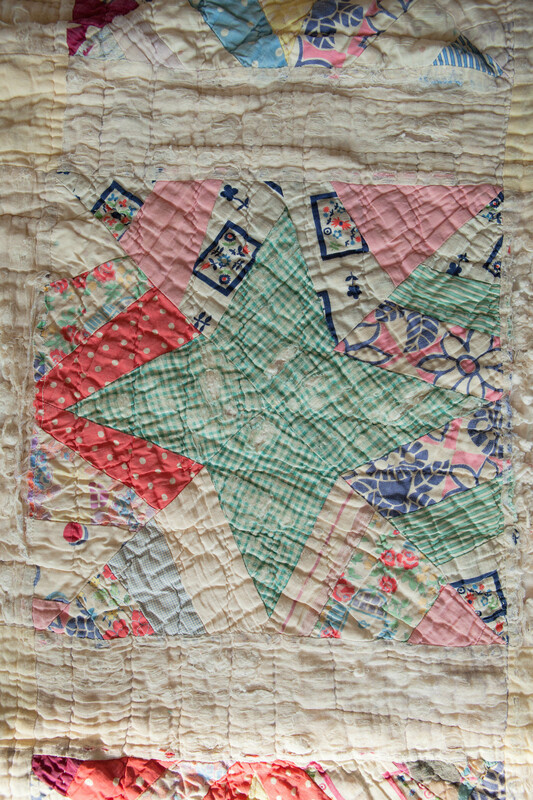 I know quilts have been “recycled” like this for centuries but had no idea the older quilt existed. 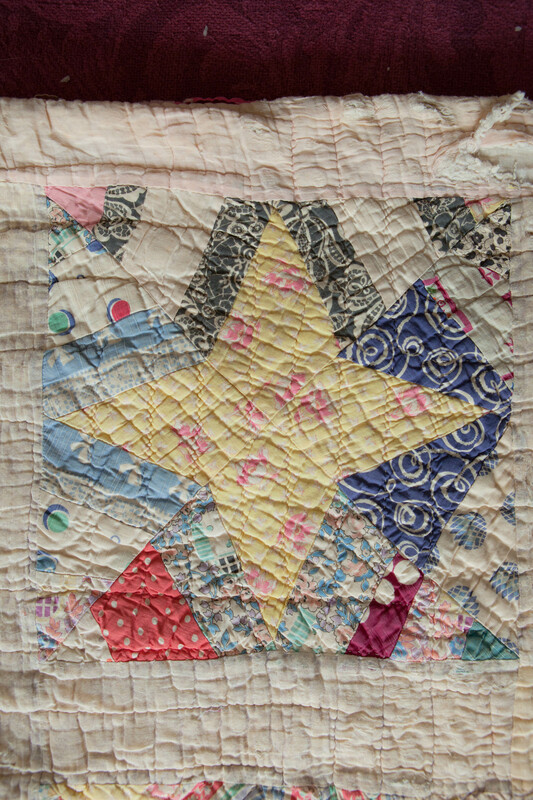 I carefully removed the hand stitched binding from one edge of the quilt and turned the quilt inside out to see the old quilt. What a beautiful surprise! 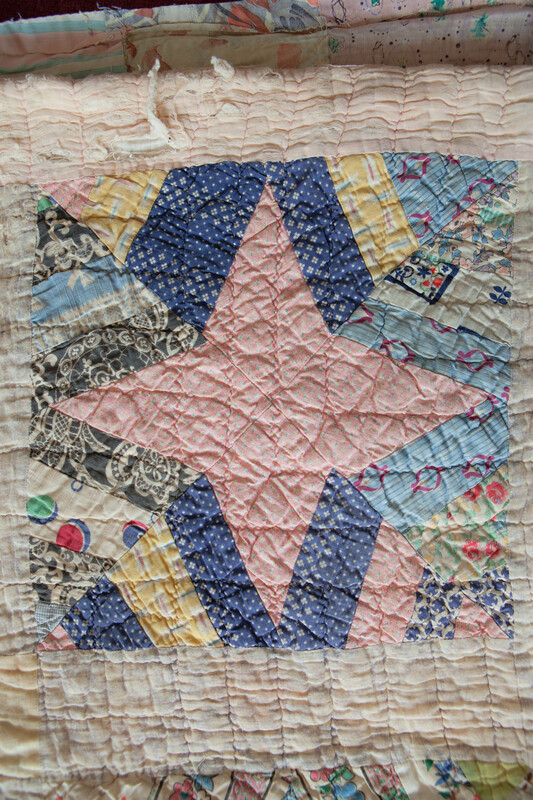 This old quilt is actually inside the red, white and blue quilt, which has been turned inside out. 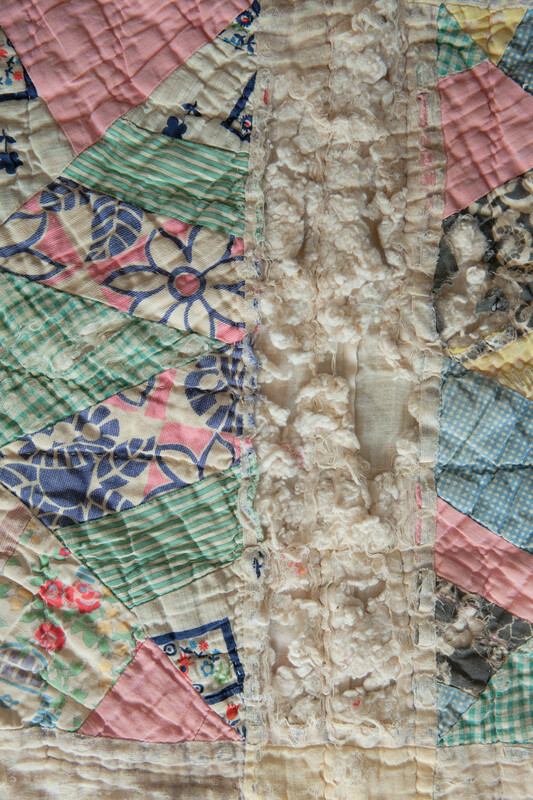 There is significant damage in several places of the old quilt. 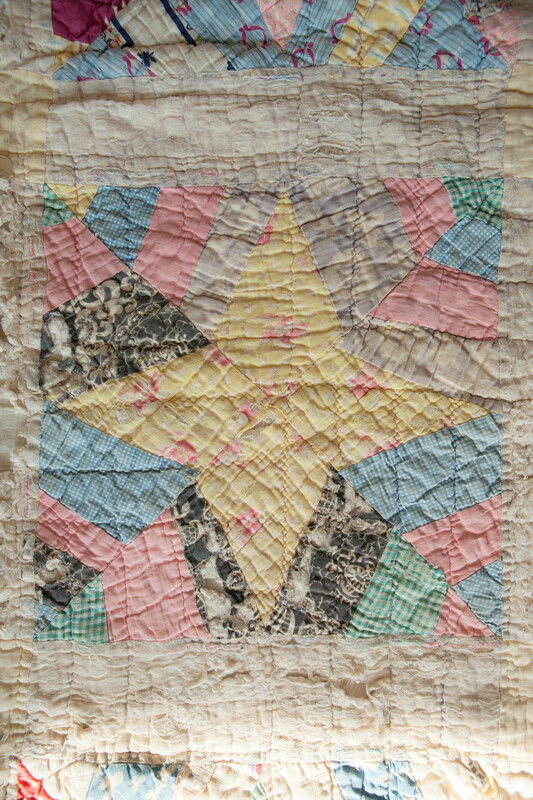 But I find the worn spots warm and charming, much like the tattered sections of old jeans. It’s a sign of having lived fully. 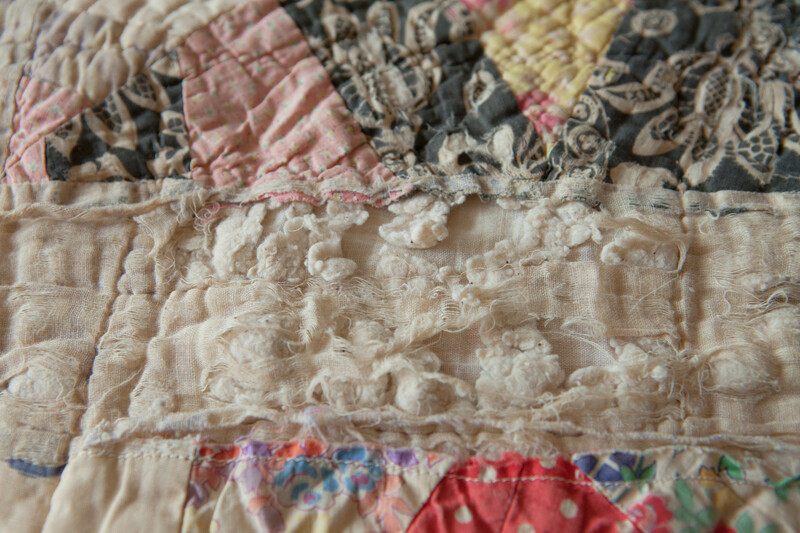 The tattered sections of the quilt are beautiful to me. 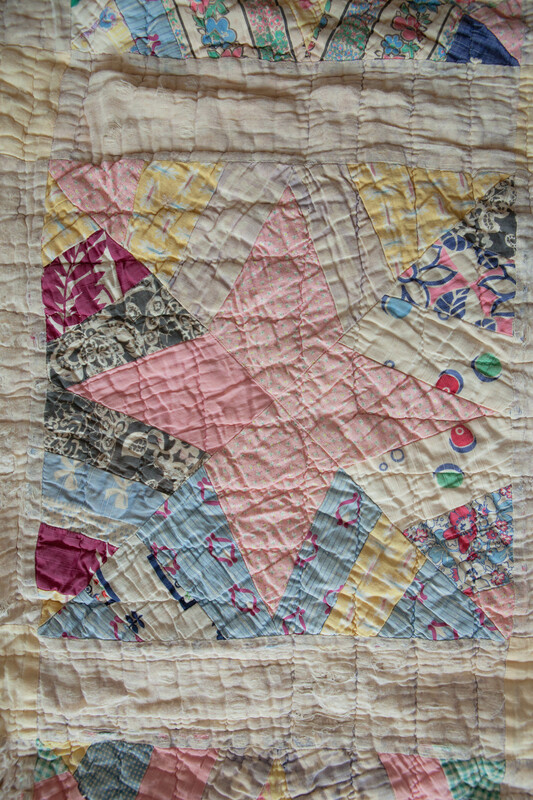 The next quilt I make will have intentional peeks at the insides. It’s all beautiful. 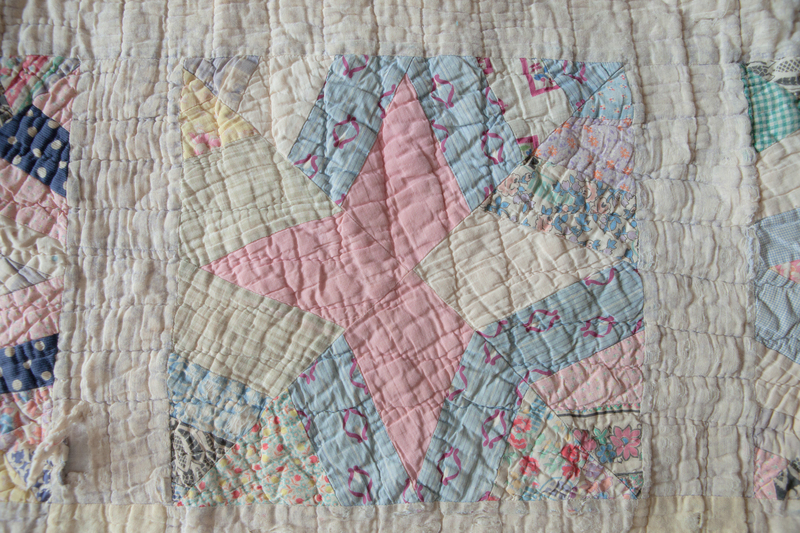 I think I’ll leave the red, white and blue quilt side turned inside for a while and enjoy this lovely pastel beauty for a while. She sketched the princess in her sketchbook while I was busy in the kitchen. I didn’t even notice what she was drawing until it was all done. 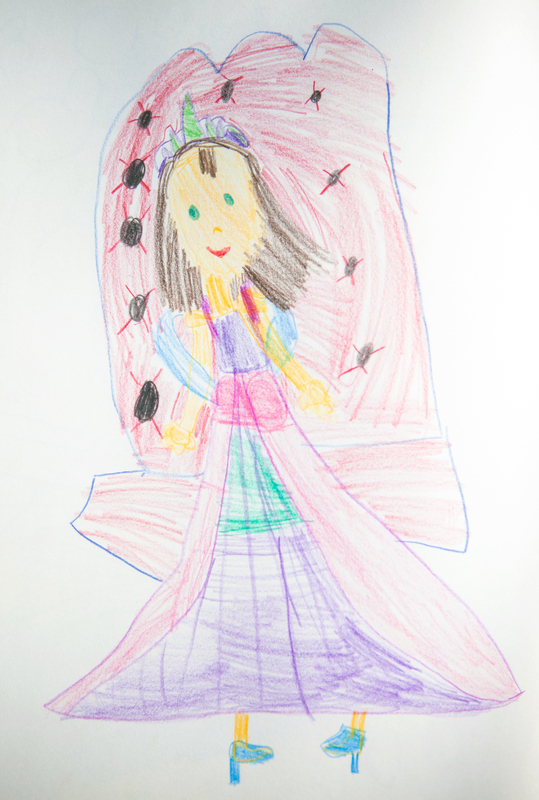 A Princess, by my seven year old granddaughter. A couple weeks came and went and she turned seven. 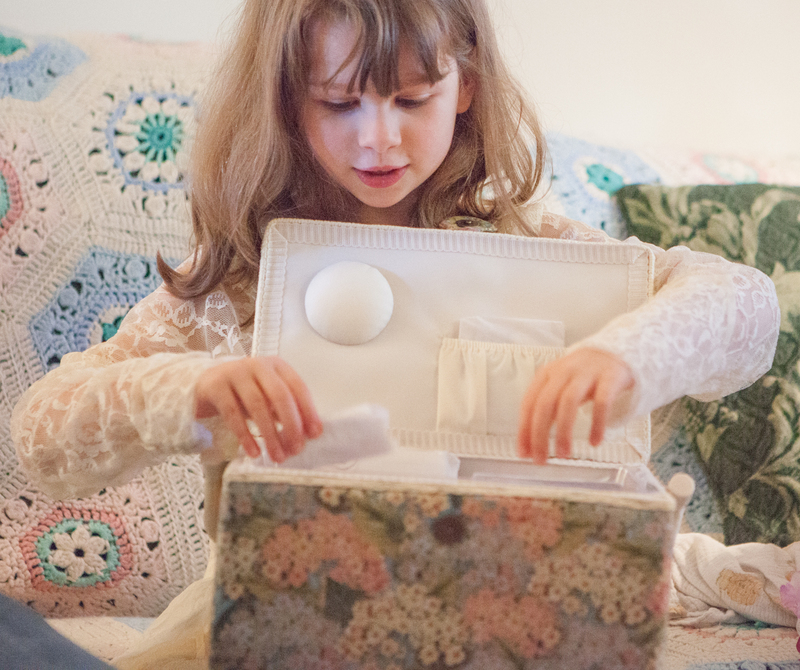 For her birthday, my mom and I got her a sewing basket filled with notions. She was thrilled with them! My mom also got her a stash of amazing fabric. Oh the color! Oh the sparkles and sheers! She wanted to look at the fabric right then but the other party goers were waiting so we had to move on. Fat quarters and quarter yards of lovely fabrics. She visited again and we got out the sketchbook. For the first time I really looked at her drawing. What a splendid imagination she has! 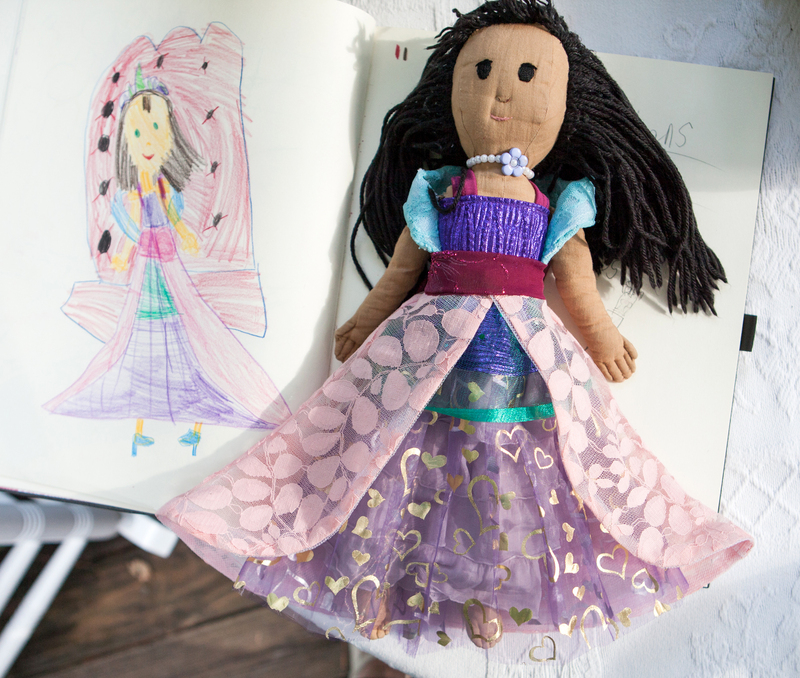 I was amazed at how much her sketch looked like her doll so I told her we would make the princess dress for her doll. I asked her to explain the picture to me. “The aqua thing that goes around her back is flat and sticks up. You know, like the things that queens have.” I had no idea. “No…” she slowly said. “But that’s ok if that’s how you have to make it. It will still be ok,” she said with a tiny sigh of resignation. She had high hopes in my skill but I wasn’t as confident. 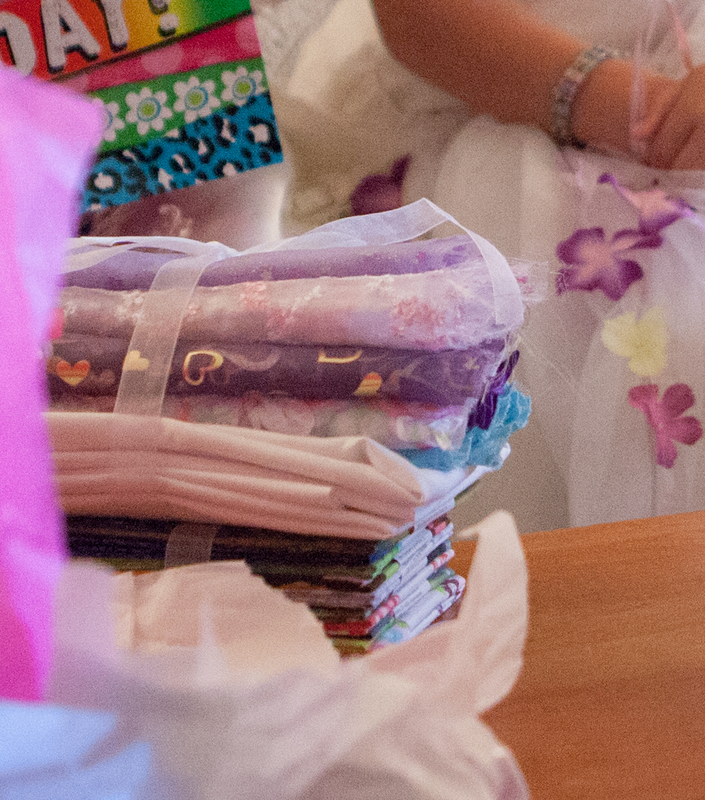 We spread out the fabrics that her Great Grandma got her for her 7th birthday. 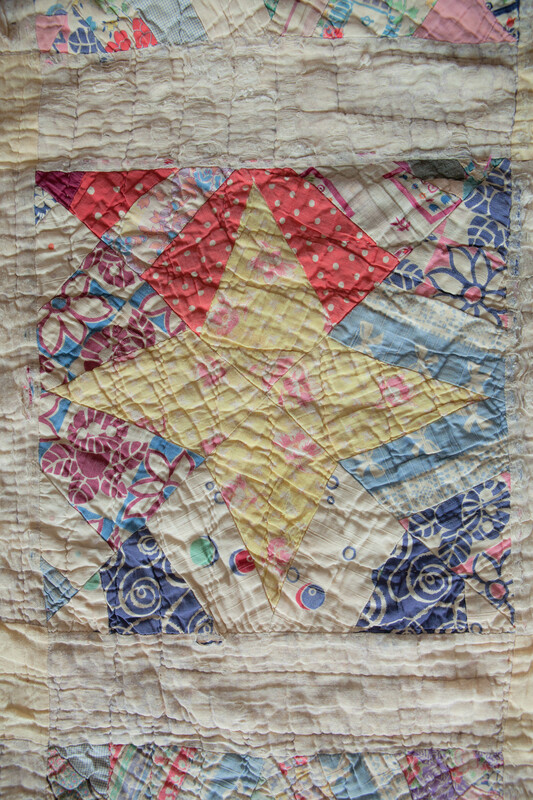 What a surprise to see that so many of the fabrics matched the sketch! It was important that the colors and sheerness match so we dug through my bins of fabric too to find all the pieces. 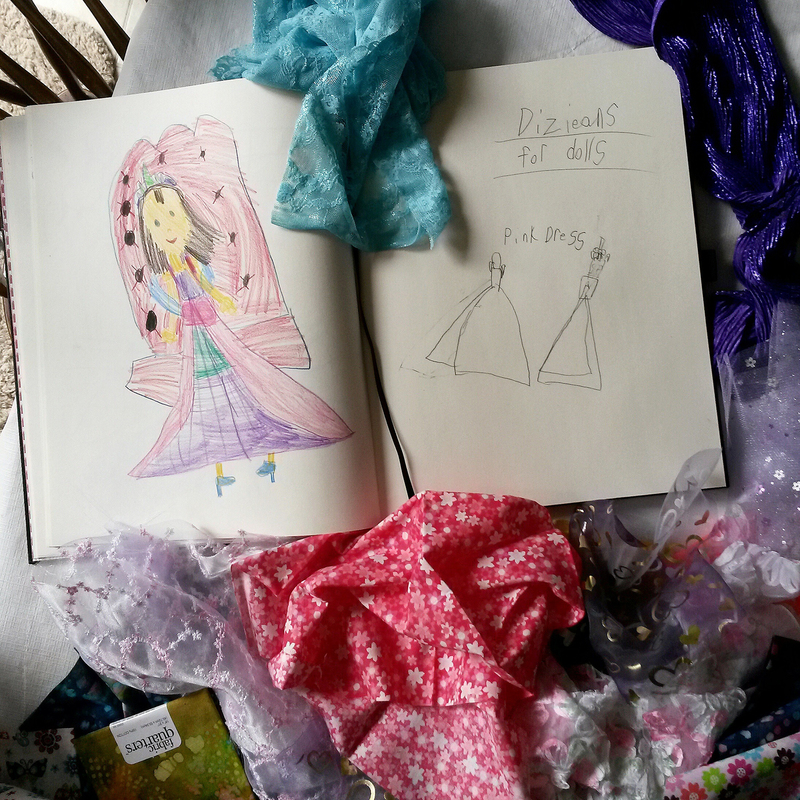 Matching fabrics to make the Princess doll dress in her sketch. We discussed the components of the dress and drew preliminary patterns. 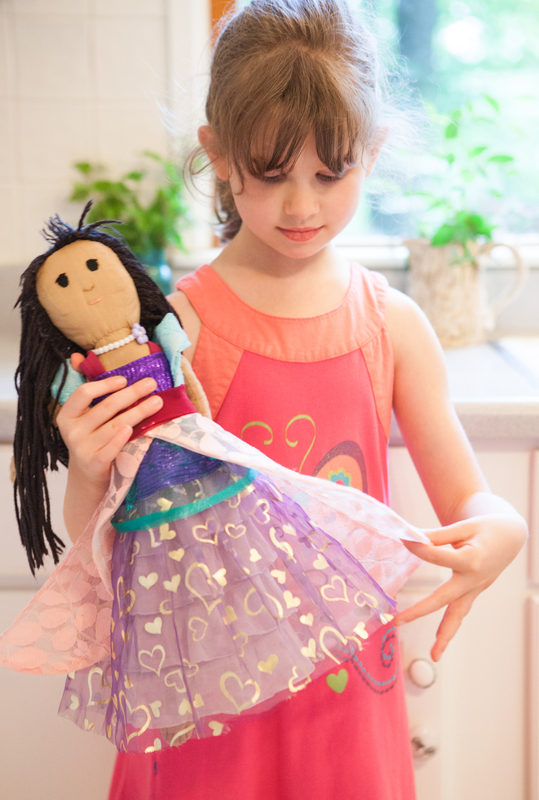 We planned how the dress would be constructed so the doll could still get it on and off, where to put snaps, which sheer pieces would be sewn together. That was complicated! She didn’t want a skirt and top, it HAD to be a dress. 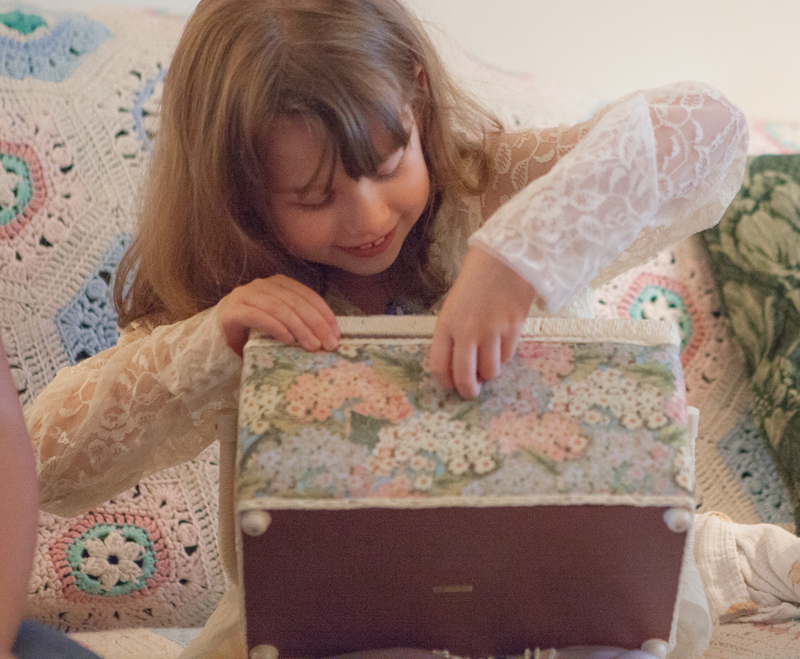 While I worked out the patterns, she played with her sewing basket. She had to go home but I continued working on the dress. First I made the underskirt from a lovely ruffle fabric. 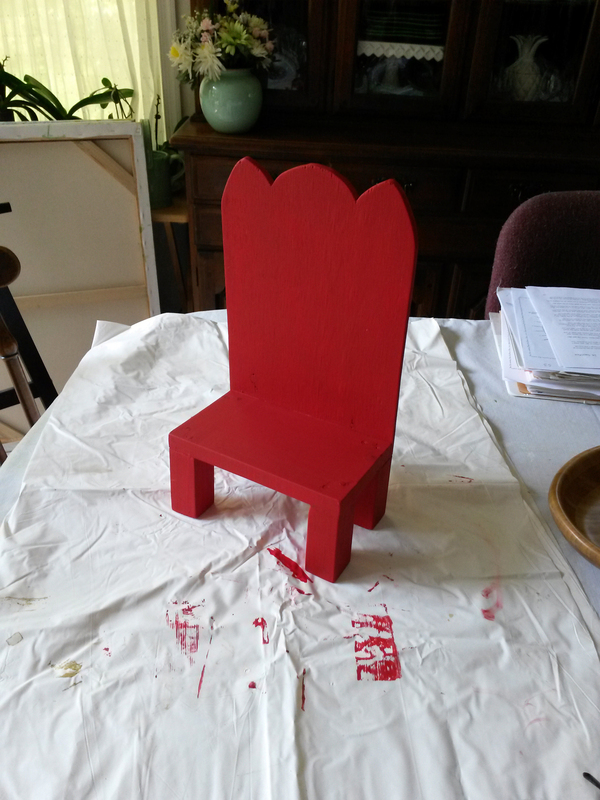 I also drew out the pattern for the throne based on her sketch and Grandpa cut it out and nailed it together. She couldn’t part with her doll and took it home so I had to use my own doll for fittings. She visited several times while I worked on the dress. It took a while to make because I was baffled by the construction. It would have been easy to stitch on the doll but I was making a garment that would withstand a little girl’s playing, complete with snaps. I wish I had taken photos of the construction. 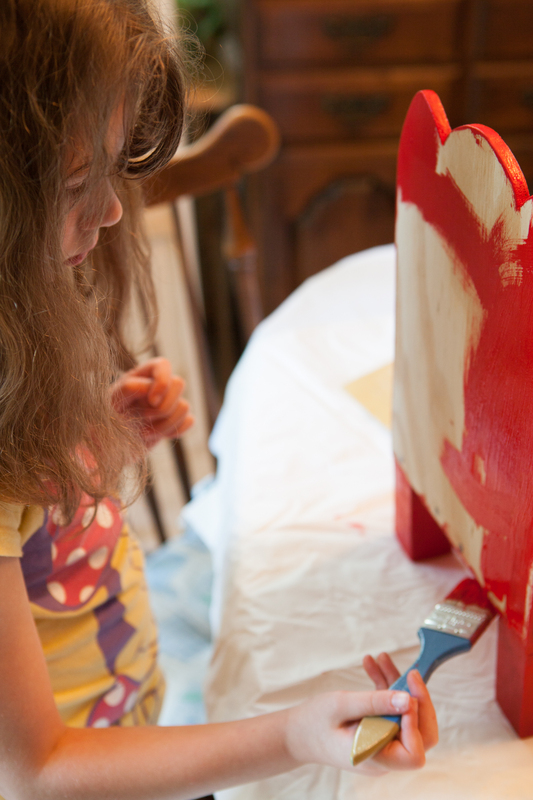 While I worked on the dress, she painted the throne and she told me more about the dress. 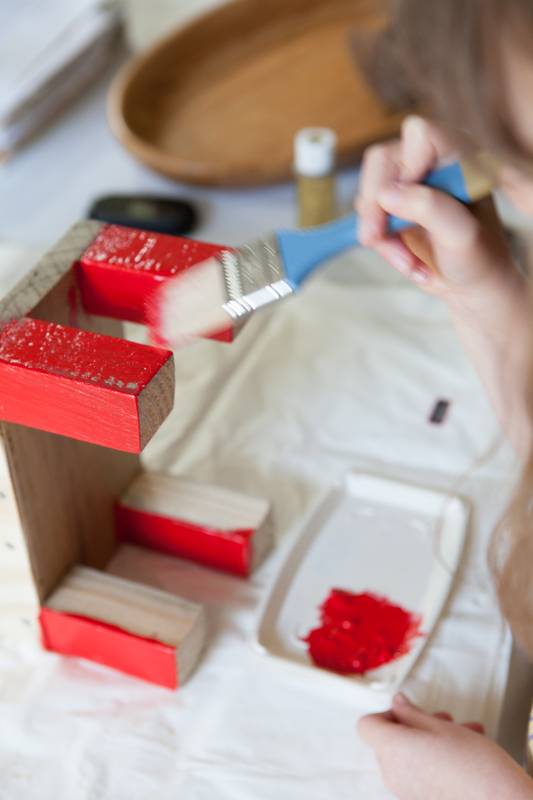 We finally used up the two old bottles of acrylic paint. 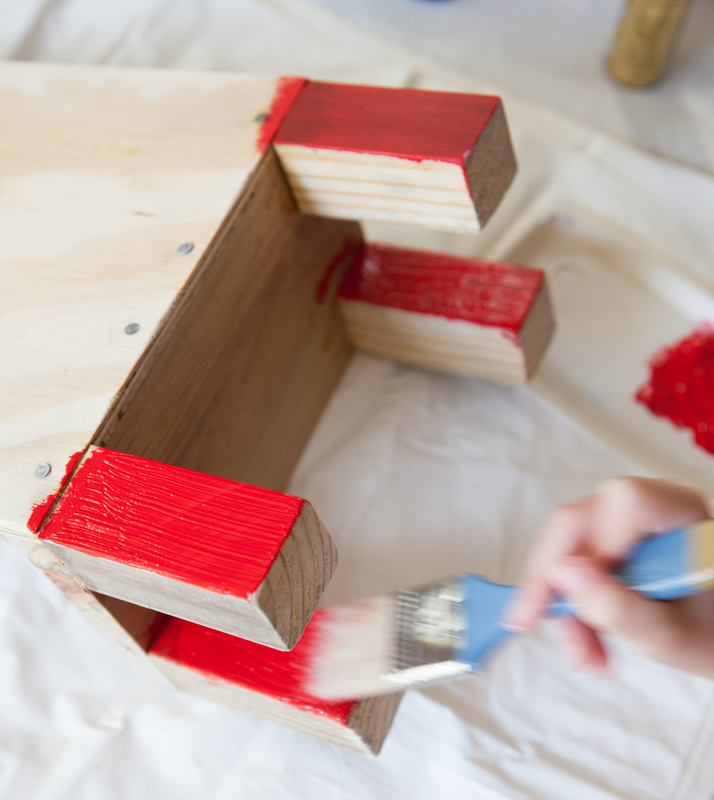 That was the very last of the red paint! Now we just have to add the tufted cushions. We still have to upholster the throne and make the crown. She picked out the fabric for the throne but I have buy little black buttons so we can properly tuft it. Or perhaps we’ll paint brads black. In the meantime, I finished the dress. 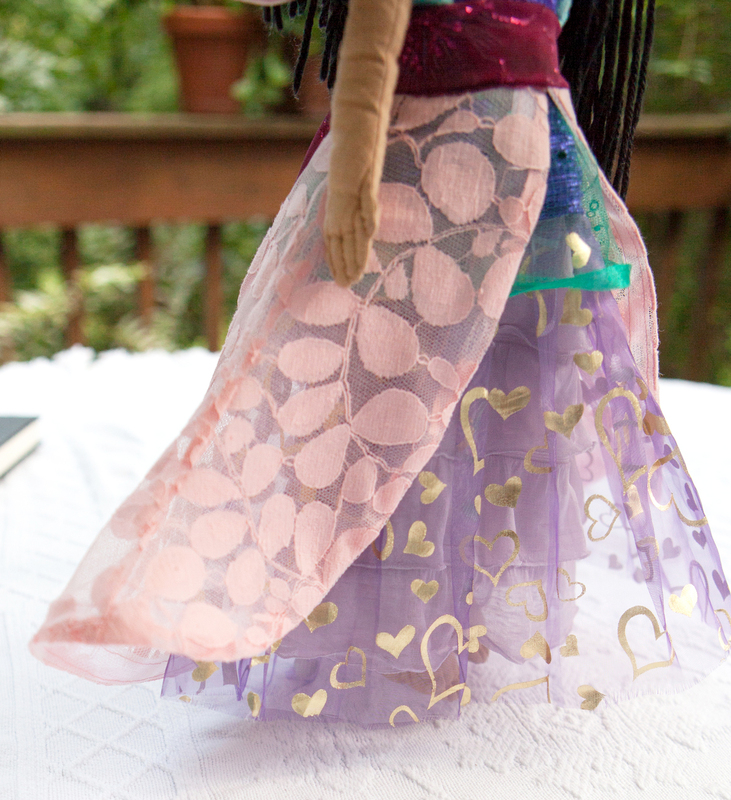 The Princess doll dress is finished! She loves it! The design and colors are all her own, inspired by the sketch in her sketchbook. The Princess Dress turned out exactly like she envisioned! There are four separate pieces: The lavender underskirt, the dress with bodice and purple and green sheer layers and stiff aqua collar sewn in the side seams, the outer pink lace skirt that snaps in front, and the wide burgundy sash. I decided to pleat the sheer purple layer instead of gathering. 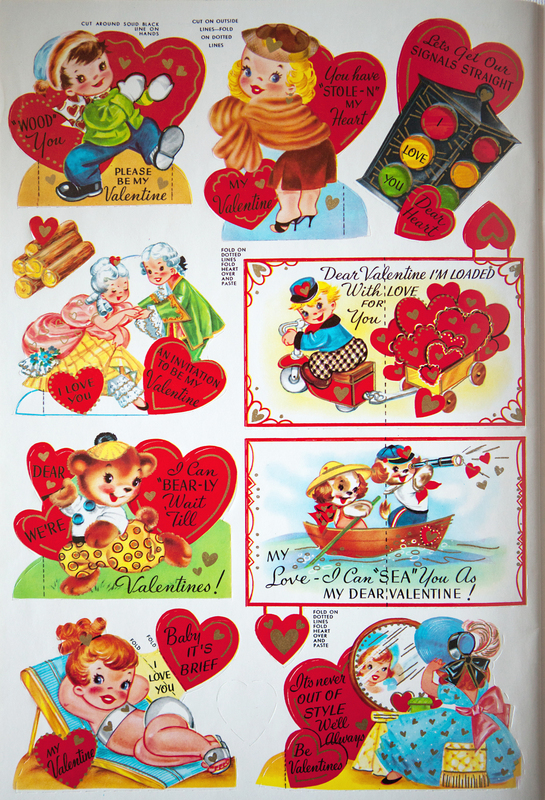 Unknown to me, the little lines she drew on her sketch were pleats! I didn’t understand her explanation of them so she’s thrilled that I figured it out. Yay! The outer lace layer is fairly stiff and sticks out just like she hoped. Click on the image to see it larger. The back is just a little puffy, precisely the way she wanted it, and the aqua collar is one piece that is attached at the sides and loose across the back. I stitched wires and horsehair braid in the collar so it keeps shape. To get the dress on, the collar is slipped over the doll’s head. Then the back is closed with three snaps. It was important to match the colors in the sketch. But even more important were the “points on the side, to make it pretty.” To make the “points” on the side, the outer pink lace layer is made of three pieces, seamed at the side. It is lined with netting, with horsehair braid at the hem to keep the edge stiff all the way around. 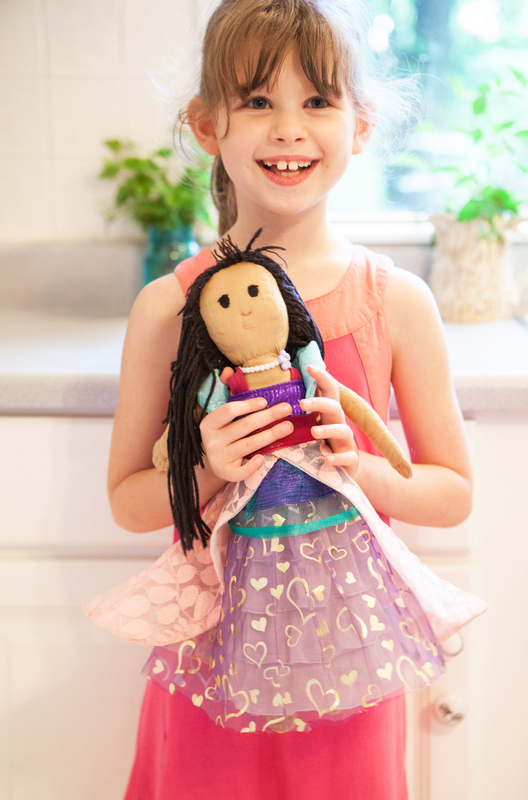 After seeing how adorable this dress turned out, using colors and fabrics I never would have thought combine so splendidly, I can’t wait to see what else my granddaughter designs. I love her style! Loving her dolly the Christmas I gave it to her. And still loving her doll four years later. 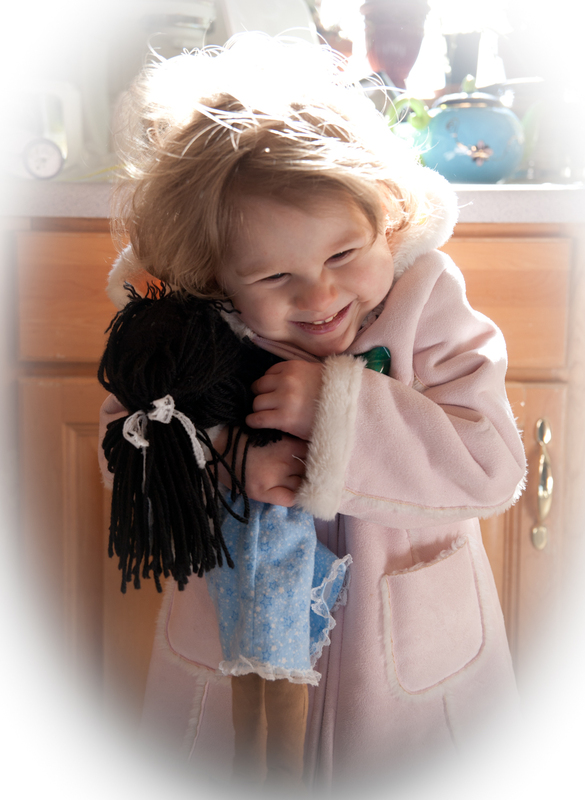 Still loving her dolly, four years later. It’s her own design. She sketched it in her sketchbook one day while I was busy in the kitchen. The dress is done and now we’re working on the throne and crown. 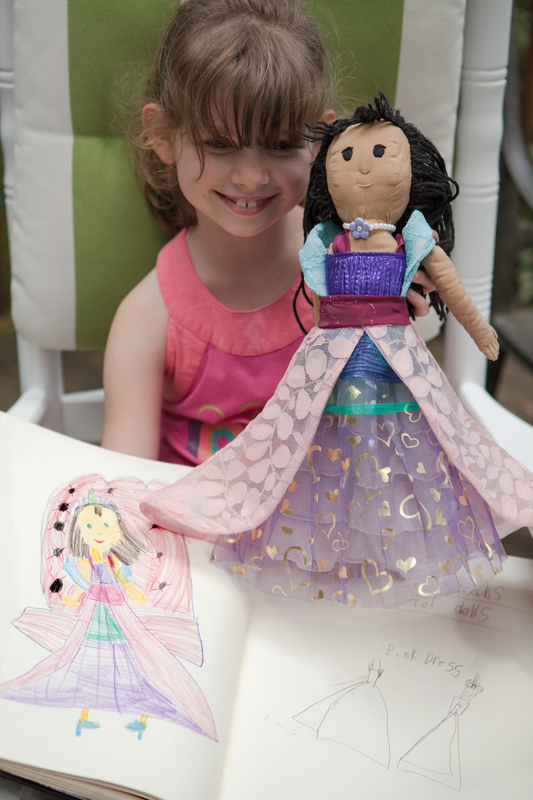 She drew the design in her sketchbook and I sewed it for her. Complete with the “flat collar piece that goes around the back” and “those lines in the fabric when it goes like this -WWW-” in the skirt, which I learned she intended as pleats. I’ll post color photos soon. 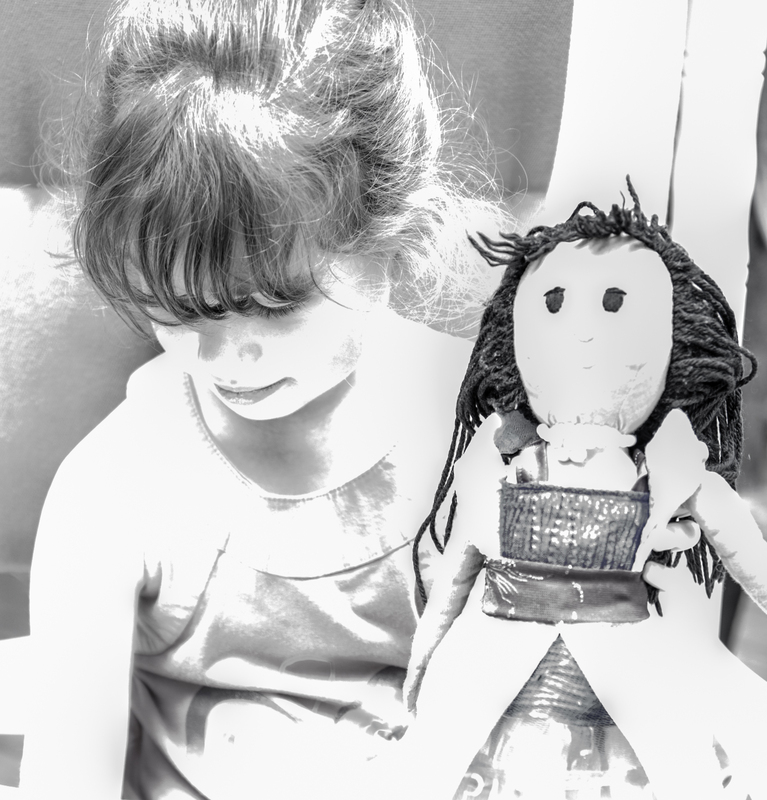 …and a doll, Sarah, with her girl. 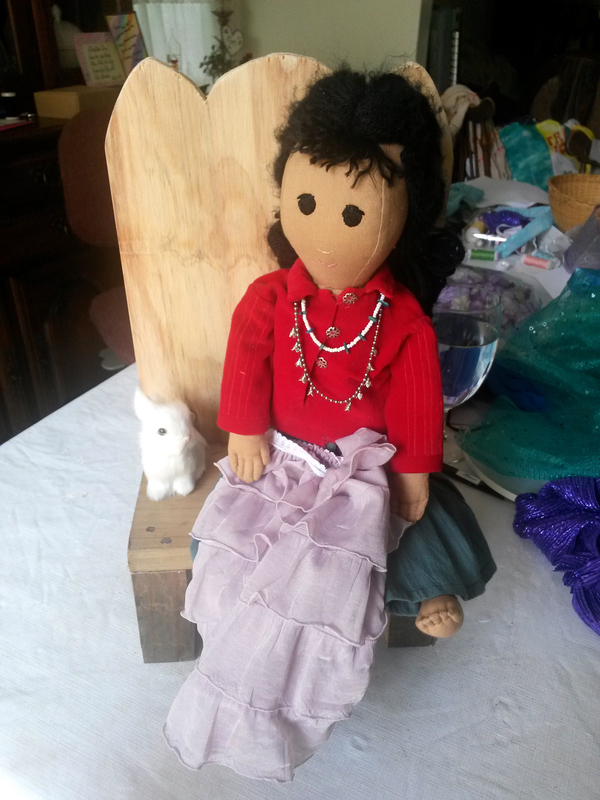 I made the doll for her three years ago, following a wonderful Indian Dolls pattern by Joan Russell. (Woman’s Day magazine, 1966) Sarah was showing signs of love and needed a new dress. 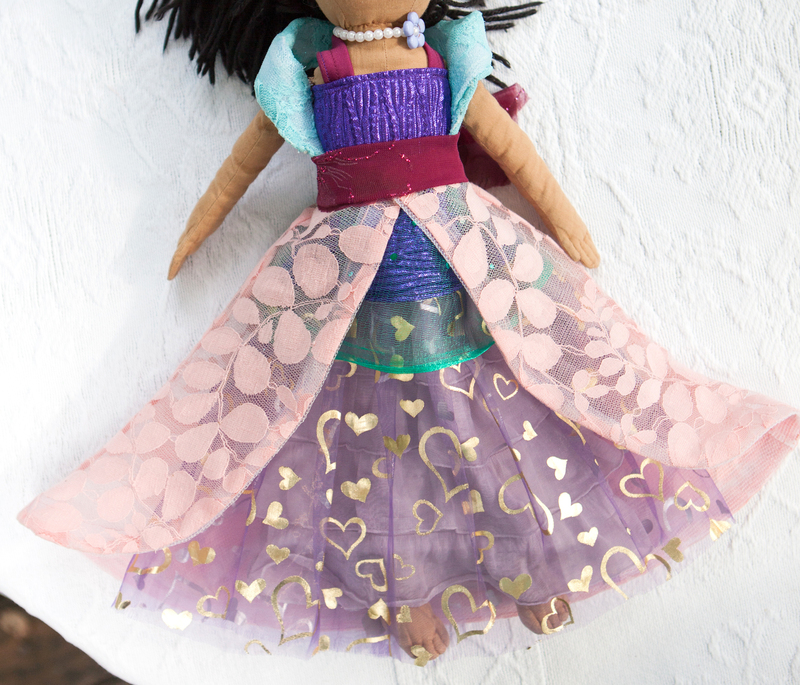 I wasn’t up to sewing so I sat in the rocking chair and cut out pieces to make a “no sew” doll dress out of non-fraying stretchy, shimmery fabric. We cut a rectangle with a small slit in it big enough to fit the doll head for the bodice and slid it over the doll’s head. I cut narrow “ribbon ties” in the side of the bodice and tied it at the doll’s waist. 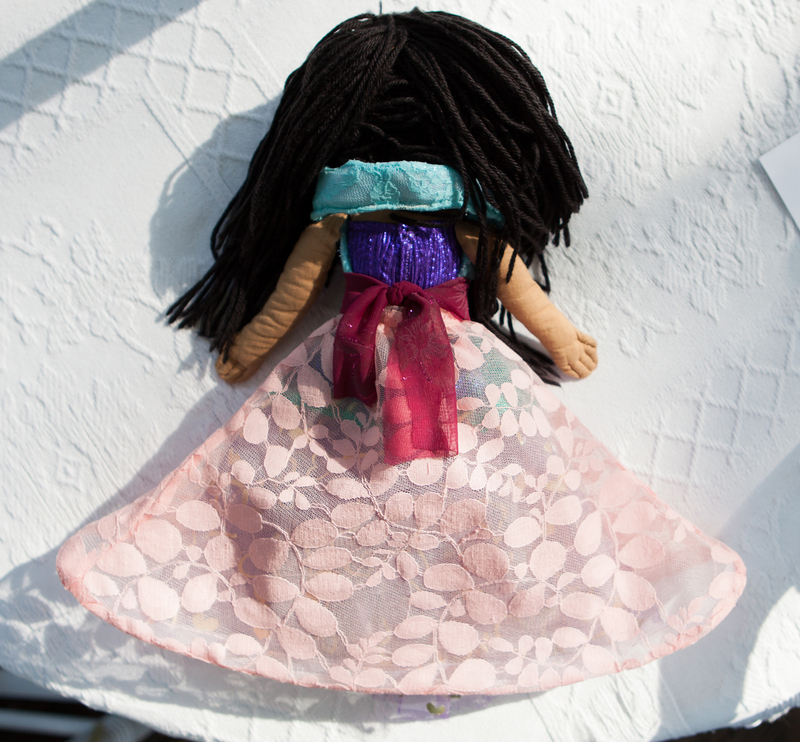 The skirt was a long rectangle with tiny slits across the top through which I threaded a long pink fabric sash and tied the skirt around the doll’s waist. Doll dress made from three rectangles and no sewing. That was fun! 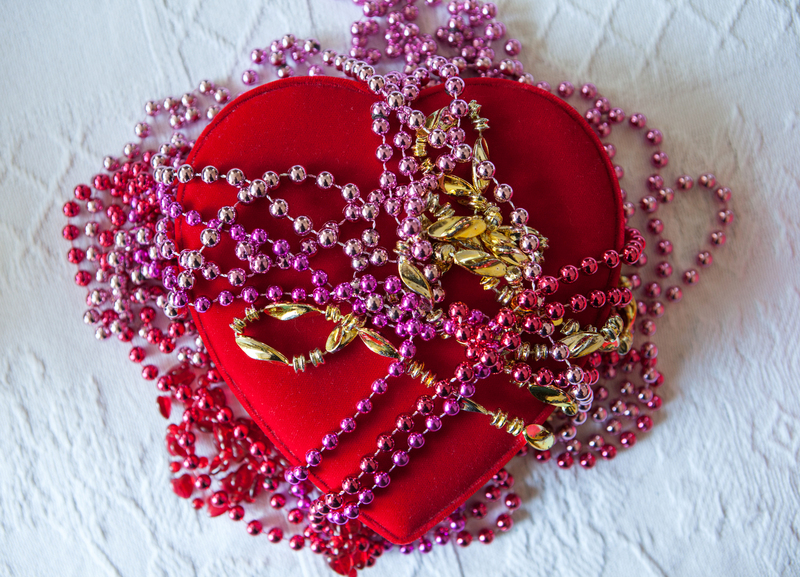 But a girl has to have beads, right? 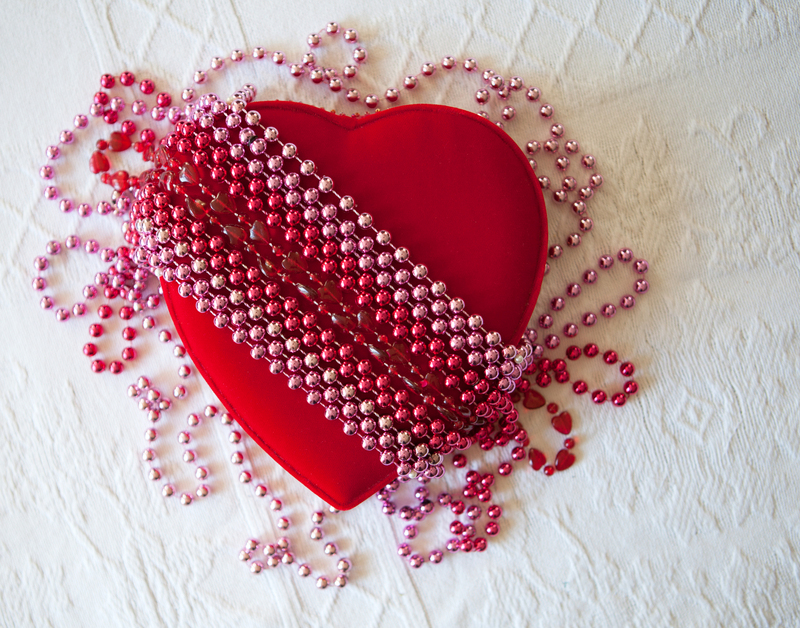 So we strung beads together to form a necklace and made loops of beads to put over the skirt sash. My QR code fabric was a success! QR Code Fabric. The white QR Tale design was printed on silky faille on the left. The gray QR Tale design on the right was printed on Kona cotton. Yay! Pardon all the exclamation points but how cool is that! Woot! My QR Code fabric on Spoonflower printed beautifully. I’m surprised QR code fabric isn’t available by the bolt yet. I’ve searched all the major fabric companies and haven’t found anything. The options for code in fabric are endless and super duper fun. I had this fabric printed via Spoonflower. I call it “An Unfinished QR Tale” because each block of text contains just a hint of the story. There are over 30 separate phrases in QR code in this fabric. The code squares printed up beautifully in silky faille and cotton. I thought perhaps the fabric grain would interfere with the QR reader but there was no trouble at all reading the code. I don’t have a smart phone so used a QR code app on my tablet. I had designed another QR code fabric for a ModCloth contest but didn’t win. Here is my entry for the ModCloth contest, a sweet little design featuring code and wings. This design has different text from QR Tale, mostly light and airy phrases. As soon as the QR Code on Wings proofs, I’ll be able to offer it on Spoonflower. The first two QR tale fabrics printed perfectly so they can be purchased on Spoonflower now. I plan on making more. Ah yes, so many ideas. Many tasks, all quite mixed up. On my worktable, the big red bow for the front porch, the garland lights for the back deck and the fabric roses and ruffle buds I’m making for a wreath. 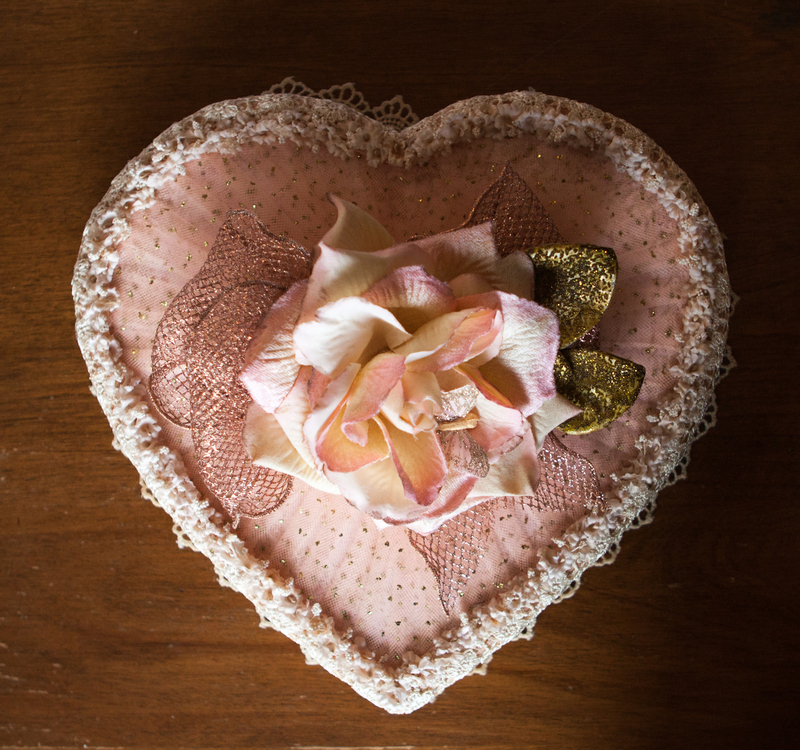 On my worktable – roses, rosettes and ruffle buds made from men’s tie wool interlinings. 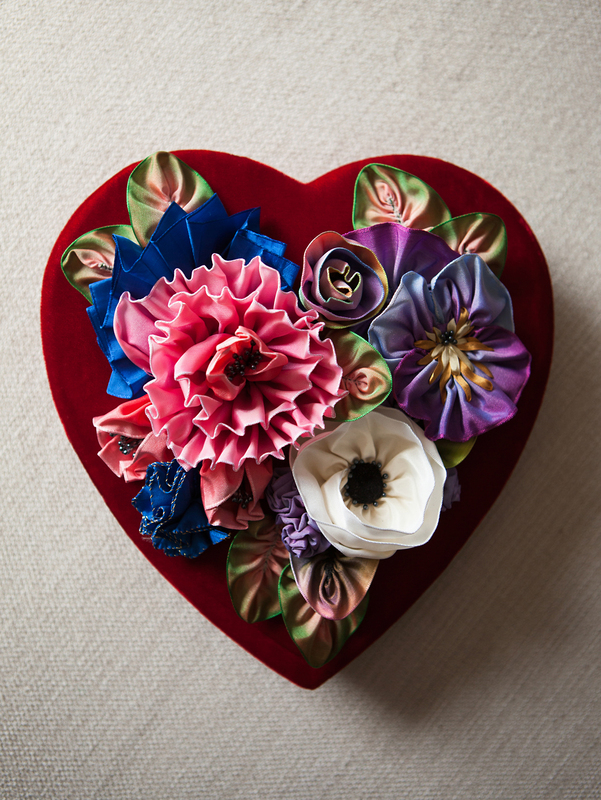 The roses, rosettes and ruffle buds are made from the wool interlinings of men’s ties. I’m saving the silk tie fabric for other projects and kept the interlinings just because I can’t bear to throw out fabric. I’m glad I saved the pieces because they make beautiful roses! I tried unsuccessfully to make a rose bud so had to come up with another design. I really like how the ruffly buds are turning out, with luscious little layered centers. The next time I make icing flowers for a cake, I’m going to try to duplicate the design in icing. 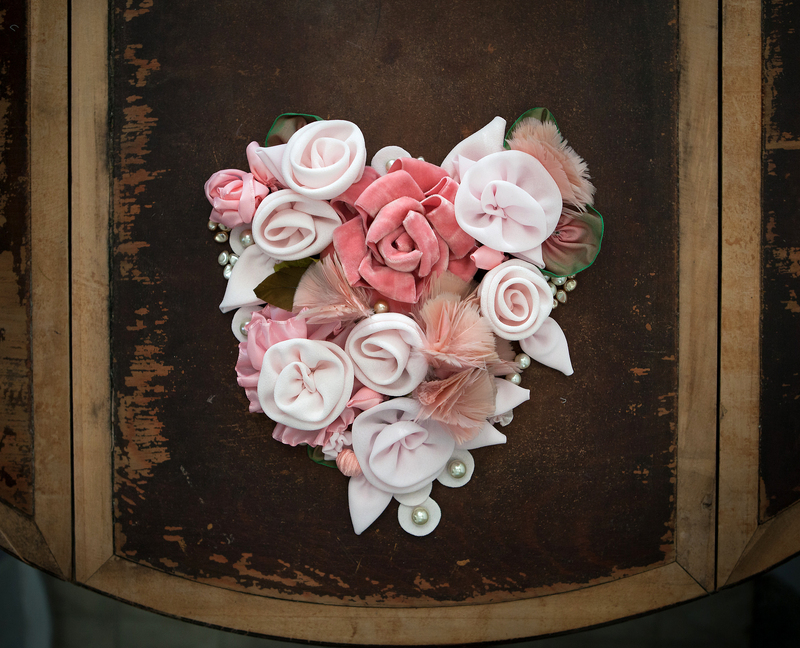 Each full rose is made from the uncut interlining from one tie. The buds are made from a narrow interlining. One of the tie interlinings didn’t need cut to make one bud but the other longer interlinings did need cut to about 24″ in length. I can get two buds from one narrow long interlining cut in half. I was standing in the middle of the room with my arm up in the air but those words abruptly stopped me. It had been a rough week. Someone had said cruel things. A big and unexpected bill arrived. And there was never enough light in the room, never enough light. Everything came crashing down at once so I got mad. I was angry at others. I was mad at the never ending bills. I was mad that my back wasn’t strong enough for me to get a job and how stupid was that! I was mad that I was mad. Life wasn’t fair. So I stood in the middle of the room and puzzled all of this. There seemed to be no solution. Slowly, the anger drained out. Anger takes a ton of energy and I didn’t even have enough energy to sustain anger so I had to let it go. I forgave the cruel words. I decided to trust God that the finances would somehow work out, and maybe there could even be a solution for the poor lighting. God helped calm me down and I was aware of Him. But he was invisible and I wanted desperately to see him. Friends hug friends, don’t they? And when Jesus walked on the earth, just a touch of his garment healed disease. So I stood there and reached my hand toward the ceiling and waited to touch the hand of God. How soon we forget sometimes. It was just a couple minutes before that I decided to let go of anger and now it started to bubble up again. Only this time, it was against God. I started toward the bed, my hand still held high, but God interrupted my thoughts. His voice wasn’t angry, it wasn’t impatient or disgusted. It was calm and honest. I let my arm drop and stared at my hand. What on earth did that mean “You’re reaching the wrong way?” If holding my hand up was the wrong way, then I had to lower it. I slowly lowered my hand, lower, lower, until it was held out down by my side, palm up. Then I looked at my hand and waited and wondered. And God answered. My eyes brimmed over. Yes. This week, my hands sewed. 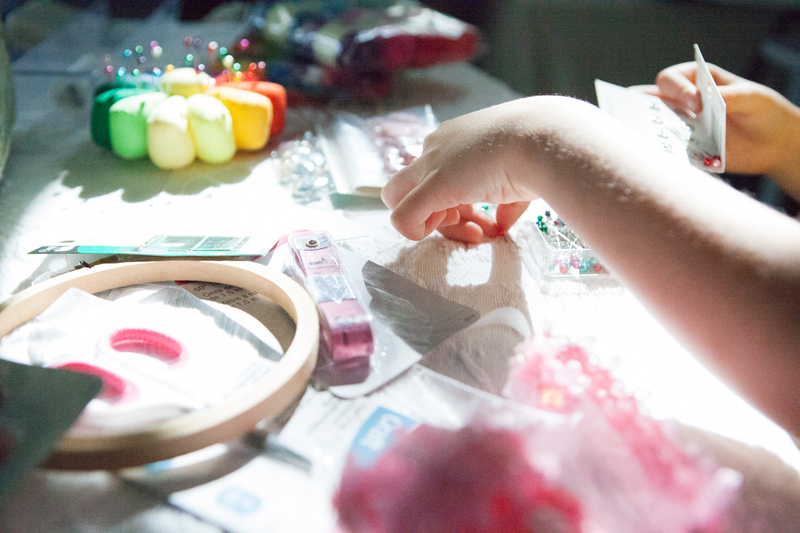 A group of helping hands gathered together to sew tote bags to tie on walkers for patients at a rehab center. I volunteered to take some unfinished bags to sew at home. The smooth fabric moved through my fingers as it fed through the machine. Despite the pain in my back, it felt good to be using my hands for someone else. Why should my hands be limited just because my back complains? It was just a couple months ago that I still needed a walker. Back then, it took great effort just to cut socks into strips to wrap the bars. It was such an effort that I could only wrap one. One of my sons finished the other. I know what it’s like to take fifteen minutes just to walk across a room. The fabric tote bags to tie on walkers are such a small contribution. But it’s the little things that make a big difference. I won’t be there to see the bags tied to the walkers. I won’t see the struggling hands tuck tissues or a pen or prescription into the bag pockets. But that’s ok. I don’t need to stand on tiptoes and reach up. God said I only had to reach down to someone else. What you do to others, you do unto Me. If you want to touch the hand of God, reach down to someone else. I made these for my granddaughter for her birthday last week – Two Little Princess Dolls, barely 5 1/2″ tall. It was a challenge to make them heavy. I believe doll legs and arms should flop down when you hold them so I filled the bottom part of the legs with sand to give them weight. I also half-filled the arms with sand too. The rest of the body is filled with fiberfill. I made these dolls with legs that bend at the knee so they can sit. Actually, I only made the dresses and tiaras last week and put new hair on them. I created the pattern for these dolls back in 1985, inspired by the work of Joan Russell from the early 60’s. 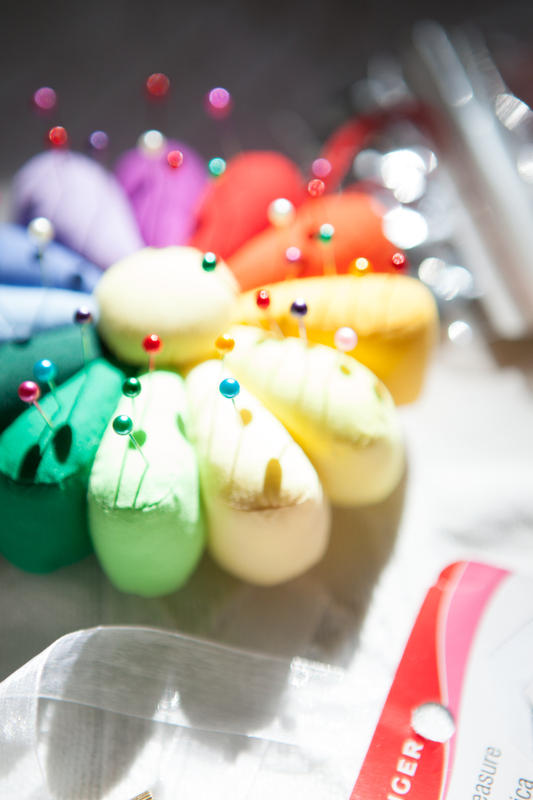 I made about 20 of these little dolls. Most were given away and I don’t even remember who I gave them to. I embroidered my name and date, J A Monroe 1985, on the back of each doll and every one was different, with a different combination of eye and hair color. Embroidered name and date on the back of the dolls. Alas, when we moved to North Carolina from Miami in the 90’s, we went through a flood and the five remaining dolls were submerged under flood water for several days. They got badly stained. The original hair was a silky “dry clean only” cord that couldn’t handle water. Here you can see some of the bad staining. 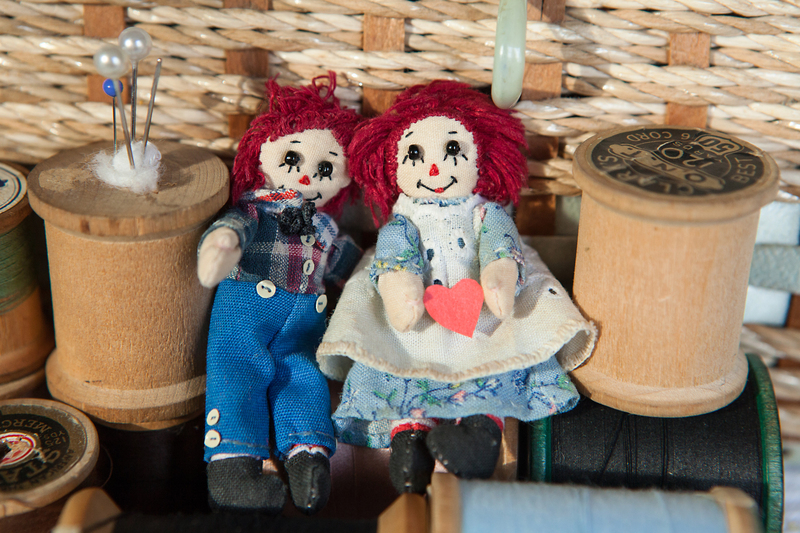 The dolls were badly stained when they went through a flood. Fortunately, I was able to bleach out the stains using full strength bleach on a cotton swab. You can see how perfectly the bleach is removing the black stain. 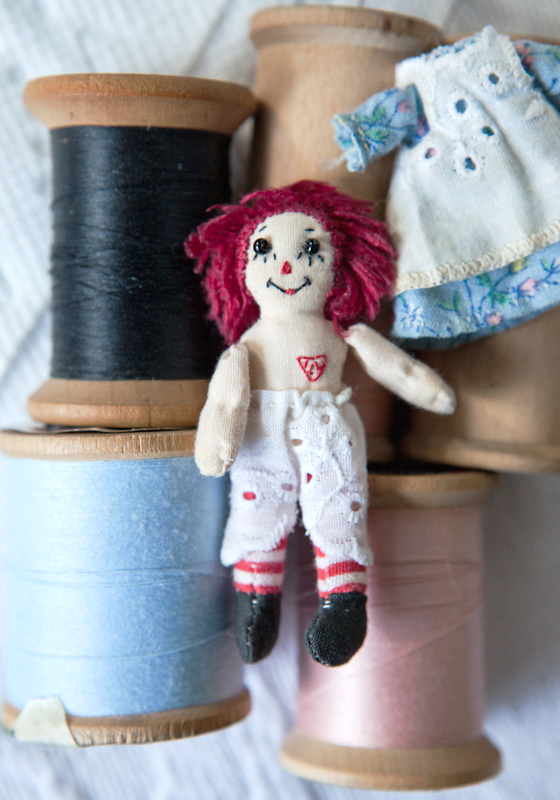 I removed the ruined hair from two dolls and sewed on hair of embroidery floss. The blond hair doll used to have black hair. What a change! I used a cotton swab with bleach to remove the black stains. It worked very effectively. 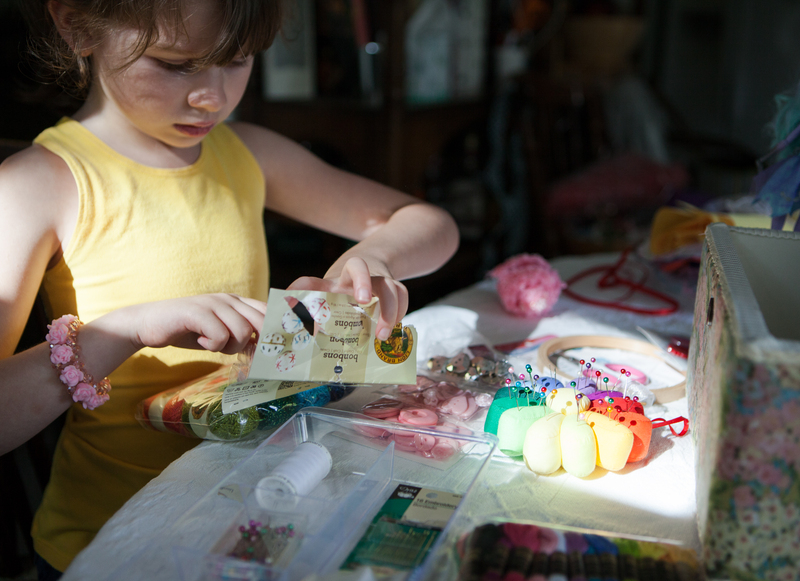 The tiaras were made by first wrapping and gluing wooly nylon thread around a wire frame. Then beads were wired to the frame. The black hair was removed and replaced with yellow embroidery floss. The dolls looked much better with new hair and tiaras. The clothing was so fun to design! It was a challenge to find fabric with the right amount of drape. For such a tiny doll, the fabric had to be thin and soft. 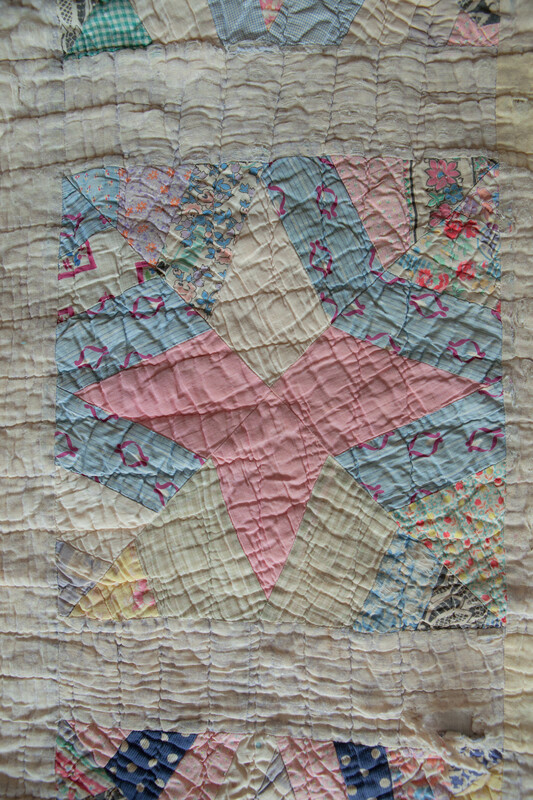 The pink dress was made from a vintage silk scarf. The blue, sequined lace was from A Gilded Life. The blue dress has one snap and the pink dress has a hook in back so the dresses can be removed. Click the photos so see a larger image for detail. Both dolls have heads fully covered with embroidered floss; I figure if little brother ever gets hold of them and pulls off the long hair, they’ll still have embroidered hair, albeit short. 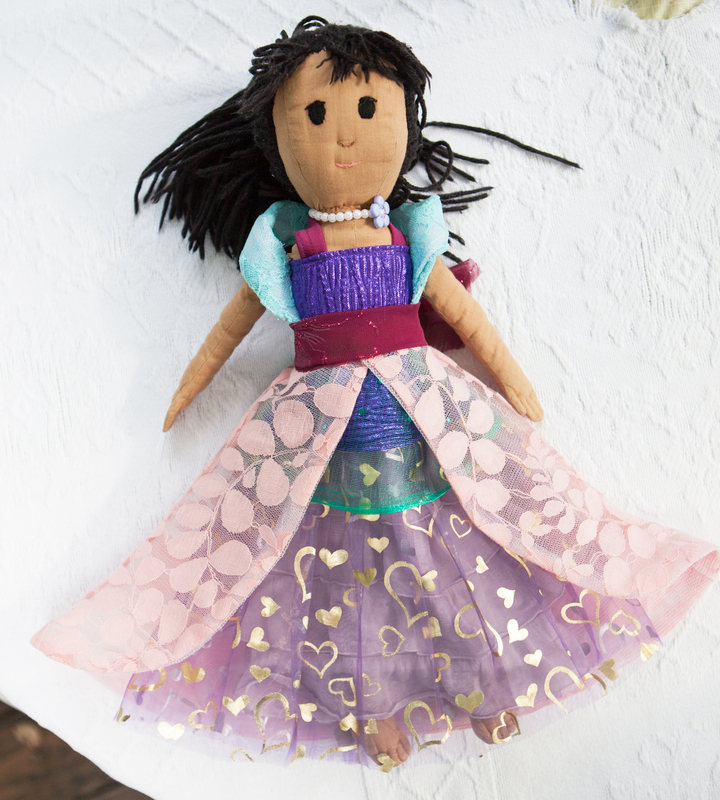 The brown haired doll’s hair is left long and can be slightly styled. To make the curls, I wrapped a tendril of floss with glue around a waxed toothpick and let it dry. It slid right off the waxy toothpick. The blond doll’s hair is stitched into a bun. 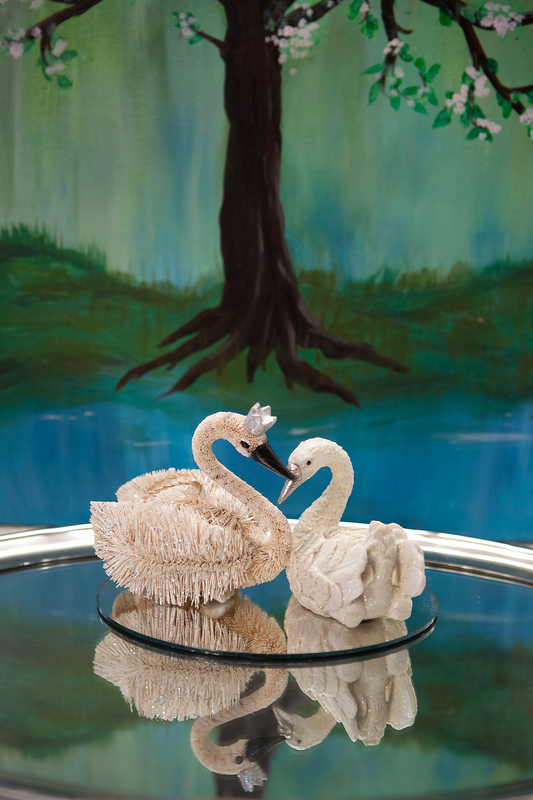 Two tiny princess dolls, ready to begin their adventures.